say cheez please: Making use of those bleeding hearts! It is a gloomy day here but I wanted to get a photo of something and I'm feeling a bit uninspired. So, I headed to my little garden area and got my dd to play around. A little color always spruces up a dreary day! Her blue eyes are beautiful! I don't think we've got these here...they are so colorful! She is adorable! I love the splashes of color in there, the pink and purples! Beautiful! This color is so pretty and vibrant! Love your garden area. Your colors are so bright and punchy here! Pretty flowers! color in the garden is beautiful! oh those eyes! lovely. your garden is a nice bright cheerful place. Gorgeous eyes! Lots of nice color in this--she looks like a fairy in the garden. You've got some beautiful flowers already growing in your garden! Great background for her sweet face. What a cutie, her eyes are just beautiful! And such pretty colors around her! This photos just has a really dreamy feel to it. I love the colors. love the bleeding hearts!!! they are such a fun and unique flower! Nice shot. 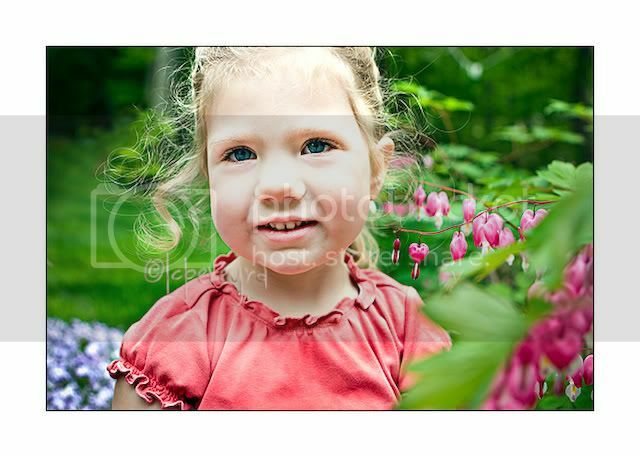 Shes is so cute and the bleeding hearts are pretty. WOnderful capture! Love the color.